Dr. Weeks’ Comment: Crooked business people keep two sets of books. Would you be upset if your government kept two sets of safety data re cell phones? SACRAMENTO ”” For years, state health officials kept secret a set of guidelines meant to inform the public about the risks associated with cell phone use and the best practices to avoid potential harm. On Thursday, the California Department of Public Health released the guidelines, which advise cell phone users to keep the devices away from their bodies, keep calls short and to use the speaker phone on lengthy calls. The guidelines were released only after a Sacramento Superior Court judge indicated she would order them to be disclosed, and after The Chronicle told the state it was publishing a news story about the case. The health department’s lawyers had argued in court that the guidelines were never formally approved by the agency and that releasing them to the public would cause unnecessary panic. In an era where the laptop is king, many people spend more time glued to a TV screen than talking to family members and nobody leaves home without a cell phone. But how dangerous are these habits to our health? Alltime10s investigates. “This could have perhaps saved some lives if it had been published by the department seven years ago,” said Joel Moskowitz, a public health researcher at UC Berkeley, who sued the public health department last year after his requests for the guidelines were repeatedly denied in 2014. The guidelines suggest limiting cell phone use by children and teens to “texting, important calls and emergencies.” Pregnant women are also at risk for increased exposure, the document says. It says people can lower their exposure by using speaker phone or a headset and not sleeping with the device or carrying it in a pocket unless it is turned off. The guidelines are relatively similar to those released by the Connecticut Department of Public Health in 2015. Moskowitz said the public deserves to know if the guidelines were withheld for political reasons or due to industry interference. Attorney Lisa Tillman, a deputy attorney general at the state Department of Justice who represented the public health department in the case, said the state agency is not required to warn the public of health risks that have not been proven. “We don’t want to disseminate information about something that hasn’t been established as a health hazard,” Tillman said at the court hearing in Sacramento last Friday. But at the hearing, Sacramento Superior Court Judge Shelleyanne Chang said the department ”” which is charged with protecting the public health ”” has an obligation to inform the public of its findings. Chang said she found it “pretty astounding” that a public health department would argue that it doesn’t have to release public health information gathered by its own scientists. While Chang issued a tentative ruling last week indicating she would order the document released, she had 90 days to make a final ruling. Environmental health experts like Dr. Devra Davis, a Wyoming epidemiologist and toxicologist, have argued for years that there needs to be more public awareness about the potential dangers of cell phone radiation. Cell phones carry warnings, but they are often hard to find. For example, the iPhone has a legal disclaimer regarding radio frequency exposure that says the device should be carried “at least 5 mm away from your body to ensure exposure levels remain at or below the as-tested levels.” That warning is buried in the settings of each cell phone. Davis’ group, Environmental Health Trust, has a website called showthefineprint.org that helps users find the warnings on their cell phones and urges manufacturers to put the information where users can find it. But, warning labels about potential health impacts of cell phones have been strongly opposed by the wireless industry. After Berkeley adopted a city ordinance in 2015 requiring cell phone retailers to warn customers about potential health impacts, an industry group, CTIA-The Wireless Association, sought a court order barring the disclosure. Last year, a federal judge ruled in favor of the city ordinance, which tells customers that carrying switched-on phones too close to their bodies might expose them to radiation levels higher than recommended by federal guidelines. In 2013, CTIA used the courts to block San Francisco from requiring retailers to tell customers that their cell phones could expose them to dangerous, possibly cancer-causing radiation. The city dropped its ordinance after a federal appeals court barred its enforcement. A CTIA spokesman said the guidelines released Thursday by the public health department “appear to be contradicted by the consensus of the scientific community.” The Chronicle shared the guidelines with the spokesman, who declined to be named in the story. CTIA said numerous organizations and health experts have shown no known health risk to radiation emitted from cell phones. “This may be why the state itself described the document as a ”˜work in progress’ that is ”˜subject to revisions,’” the spokesman wrote. Moskowitz said at least 10 peer-reviewed studies have looked at the long-term use of cell phones and that many of those found an increased risk of brain tumors. He said other studies have found links between sperm damage in men when they keep their cell phones in their pockets near their testis as well as reproductive health effects in women. 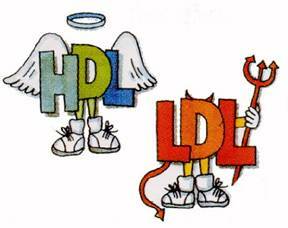 Good and bad cholesterol – worth a second look.